Even though the modern cook prints recipes from the internet or even flips through them on his or her iPad, I still love a colorful cookbook to get inspired from. Book lovers surely understand what it is to physically touch what you’re reading and having it tucked in safe onto your bookshelf. I know I write recipes and I’m counting on you guys to refer to them for this blog to survive 😉 but physical stuff still matter. So here are 5 books for your kitchen shelf to keep you inspired and motivated to be a better a cook. I’m not a person who can commit on the long-term to something that doesn’t really, truly interest me. I’m more the type of person who embraces change and actually needs it. If I decide to start a new hobby or commit to something new, you’ll find me losing interest more often than not. On the other hand, some things and people remain in my life forever. Moments I love become habits I foster over time, and I make it a point to keep loved ones happy. I’ve mentioned before that this blog is a true passion and that it reveals aspects of myself that even I hadn’t discovered. In 2015, it has brought me a lot. Not only did I see that what I write is appreciated (check out Breadonbutter as the number 8 most influential blog in Lebanon! ), but I also challenged myself through it. Through my monthly bucket lists, I was able to set small goals that led to achieving bigger ones. It was a pleasure writing each and every one of these lists. You can check them all here. Attending Food Blogger Connect 2015, meeting great people and tuning in to amazing talks by inspiring people. So I have this thing with mugs. Whenever I happen to be someplace that sells kitchenware, I run to the mug section. There, I can spend hours scrutinizing each one, looking specifically for big fat cozy ones with soothing colors. You might think I’m crazy right now but I’m sure lots of you can relate. As you might have seen on Instagram (@breadonbutter_), we’re in the process of renovating a recently-bought apartment. We’re changing everything, from tuyauterie to walls, to windows and halls. But all I think about is my mug collection. Here are my favorites. They are very “Design”, trendy and not cheesy at all. Here goes! The Pantone Series – I still am looking for those in Lebanon so if anyone has any idea on where to get them, please leave a comment below! As we are starting the new house plans and pinning pictures that reflect the style we wish to achieve, my Design antennas are sharper than ever. I can’t wait to unpack the stuff we’ve brought from all of our trips and to try new DIY projects again. Of course, the kitchen is of great importance in Breadonbutter’s house 😉 and we are fixed on the idea of marrying practicality and aesthetics. So when I stumble upon a beautiful and handy kitchen tool, it makes me want to buy it right away. This week’s design item is this minimalistic bread box that is also a chopping board. This box not only allows you to store bread but also all kinds of vegetables and fruits, and the lid transforms into a chopping board which is great for storage. Plus, aren’t the colors lovely? The My Kilos brand is of German origin. You can check it here. All of their furniture and accessories are made in Europe: most in Germany, and from naturally aging materials such as untreated wood, raw copper and stone. They speak a very clear and clean visual language, their focus is on functionality and sustainability — and they work just as good in private apartments as in offices. The great news is that you can order it online because they ship worldwide! Since it’s Beirut Design Week and the city streets are packed with design-lovers heading to all of the events organized for the occasion, I thought I’d share with you my recent crush. I saw that copper french press at Lafayette Home back in Paris and fell in love instantly. I bought it of course but it’s safely tucked away until we move into the new house. Of Scandinavian origin, Bodum shows true functionality and aesthetics. They are specialized in coffee and tea products (from coffee makers to mugs and glasses and even travel mugs). Their production line doesn’t stop there as bodum satisfies your kitchenware needs by offering a selection of bowls, cookware, cutlery and electrics, and BBQ lovers, you get a choice of BBQ products and tools. You can check their selection here. In Lebanon, I know of BHV Déco (in City Mall and Khoury Home) and Carousel Ashrafieh, who sell Bodum products. Did you know of the Bodum brand? As you grow older, get married and start having responsibilities, your lifestyle slowly changes. For example, when you have kids like some of our friends do, you go out less and have to make do with staying at home more often. You then start honing some of your skills, like cooking and DIY projects, and when you’re lucky enough to find friends who share the same passions and hobbies, you hone those skills and experiment together. 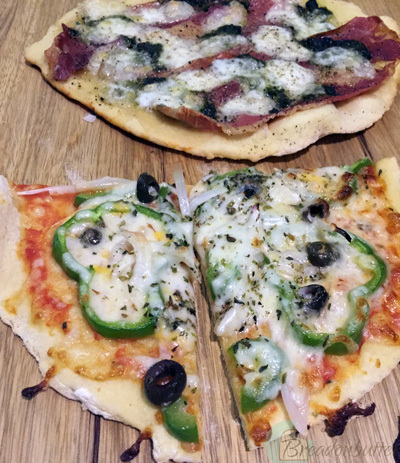 Instead of going out for pizza or crazy wings night, you go ahead and buy that bread-maker and start having your own “crazy” pizza nights at home. 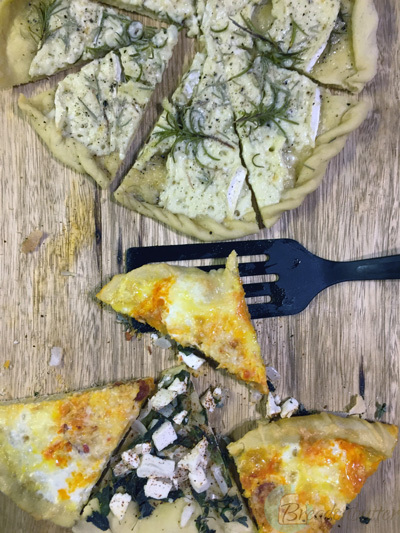 That’s exactly what we did last week over at Khater and Lea’s house (you can check Khater’s previous guest recipes for fig jam and brie crispy shells on this link and for lemony chicken on this link). 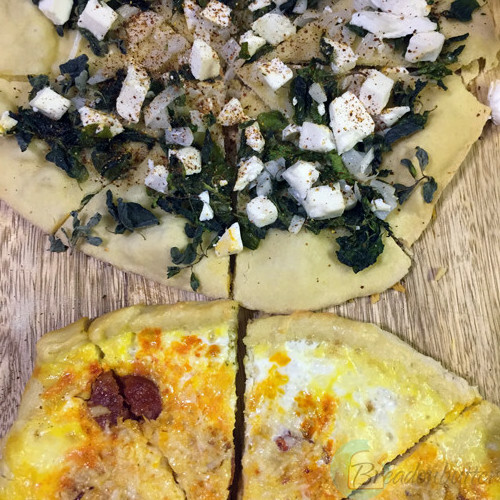 Using a Moulinex bread-maker, Khater made the pizza dough (ingredients below) and we had fun with different toppings. 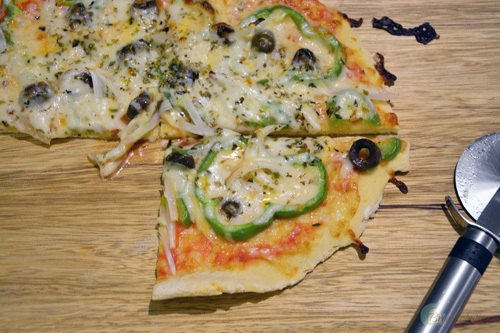 So here are some toppings ideas, with a twist, for your pizza night. 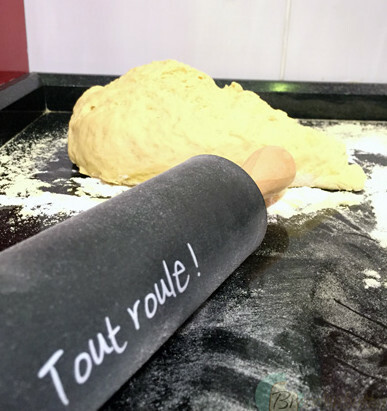 Flatten parts of the dough with a rolling pin to the size you prefer and prepare it for toppings. If you’re not using a bread-maker, you can refer to this post to read about making a dough from scratch. Top one pizza with tomato sauce, green pepper, black olives, corn, mushrooms and block mozzarella cheese. Place in the oven until the crust is lightly golden and the cheese has melted. 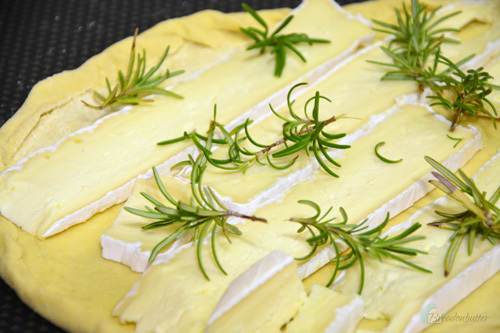 Top the dough with brie cheese and rosemary leaves. 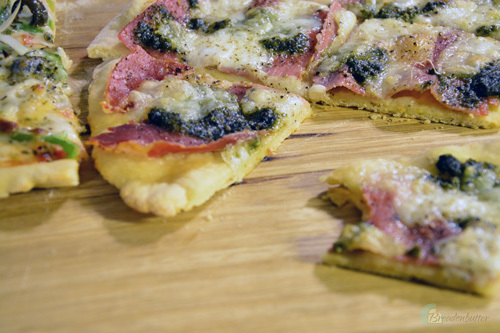 Top with olive oil and salt then place in the oven until the crust is lightly golden and the cheese has melted. 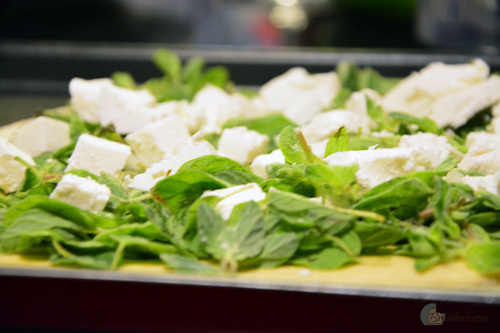 Top the pizza dough with fresh thyme leaves, feta cheese and black pepper. Place in the oven until the crust is lightly golden and the cheese has melted. Before topping the dough with the ingredients, fold its corners to prevent the eggs from overflowing. In a bowl, break 3 eggs and whip them with a fork. 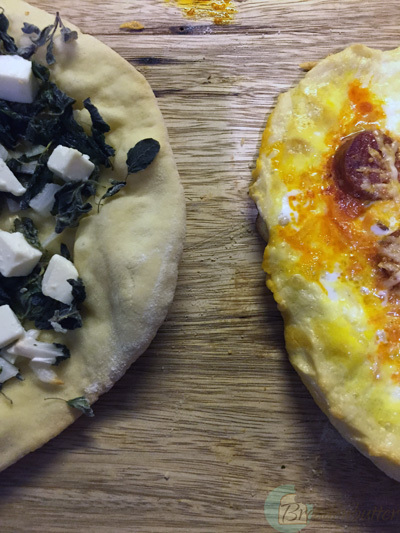 Place the chorizo on the dough and top it with the eggs. Place it in the oven until the crust is lightly golden and the eggs are cooked. 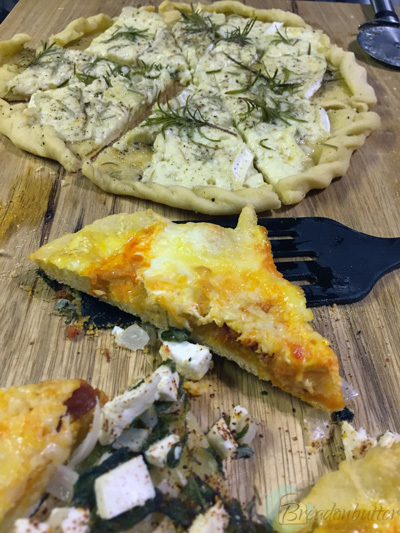 Top the pizza dough with all of the ingredients and bake in the oven until the crust is lightly golden and the cheese has melted. For more information, you can go on their website. I recently learnt about FERM LIVING, the Danish Design brand for the Home. Its simplicity and contemporary designs quickly got my attention. Last week in Paris, we visited Fleux’, a concept store in the Marais neighborhood. I was in paradise. This place is everything a Design-lover could ever ask for, including FERM LIVING products. My current Ferm obsession are these wire baskets to fill with anything lying around your home. Not only are they useful keeping any room tidy and providing storage space for blankets, cushions, magazines, laundry, books, toys or even firewood if you are a chimney owner, but they also transform into tables if you get the Ferm smoked oak tops. The baskets are fabricated with iron wire with powder coating. All photos were taken from Ferm Living’s website. You can check it here. Have you hear of Ferm Living? Do you own a piece of their designs? When I first started cooking, I secretly wished for smarter utensils that could make any cook’s life easier. I mean I love preparing dishes and baking cakes but sometimes, it’s just a hassle because of the practicality of it all. Little did I know back then that smart and beautiful cooking tools did in fact exist. They exist since 2003 under the name of Joseph Joseph. Founded by two British brothers, the brand became widely known as blending beauty, efficiency and innovation. It can be said that they have mastered kitchen efficiency, also making sure their products are aesthetically noticeable. Inspired by an office filing system with indexes indicating the categories, these chopping boards also tackle the issue of cross-contamination that comes with prepping raw food and mixing them with vegetables. You’ll really enjoy the easy and practical use. Aside from being easy to store because of its folding possibilities, this colander is also practical to slip your vegetables or pasta right in the dish. This no pain and compact garlic crusher is easy to use and easy on the arms. You can also watch the video below to get a general idea on the brand. Do you know of Joseph Joseph? If yes, do you own of the products? This week’s Design item is for coffee lovers. With this Kinto Coffee Carafe, you can enjoy watching your coffee drip into your mug with a delicious smell filling your house. This coffee carafe set is great for long afternoons at home with a really great book in hand. Experience Dripping Coffee by Hand. It will Fulfill Your Life. Time slowly goes by with each drip of coffee. The series ‘Slow Coffee Style’ was born to bring you the taste of coffee brewed by the pour-over method with the relaxed passage of time. The carafe set and porcelain brewer both offer two choices to brew coffee either with stainless steel filter or paper filter. As the extensive lineup provides a wide range of choices for item coordination, you can easily find your own style of slow coffee. The mugs with the illustrations and the message newly join the series. Kinto is a Japanese company specializing in house-ware. They showcase their products internationally, you can check their blog on this link.